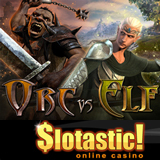 This Christmas Slotastic Casino is transporting players to the magical world of Middle Earth with its amazing new Hobbit-inspired Orc vs Elf 3D slot game. To celebrate the launch of the epic new game Slotastic is doubling players’ deposits, up to $200. The coupon code is VICTORY13 for this offer which is available until December 31st only. Orc vs Elf’s main slot game looks amazing with unicorns, mystical castles and magical potions spinning on its five reels. The 3D images surrounding the game virtually leap off the screen and draw players into the mythical kingdom. But it’s the bonus features that really set this groundbreaking new game apart. As they begin their journey players select either Orc or Elf. Their choice determines which path they will travel and which bonus features can be triggered when the Battle Bonus symbol appears on the reels. There are 7 bonus features along the path for both Orcs and Elves. Features award free spins, multipliers and additional wilds. Players can accept the feature that they trigger, or continue on their journey. Although 240 megabytes really isn’t much to download these days, the casino does advise players that the amazing images and video effects do mean this eye-popping new game takes a few moments longer than ordinary games to download and install. Online slots players from all over the world enjoy the huge selection of games and easy deposit and withdrawal options at Slotastic. It specializes in slots games but also offers Blackjack, Roulette and other casino favorites.